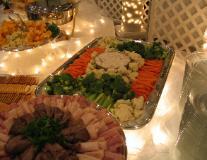 Pine Creek Country Inn has always been the perfect location for your Wedding and Reception. 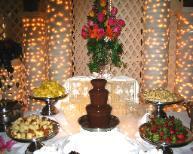 We offer a full range of services for your weddings, receptions, rehearsal dinners or any special event. Our facility is perfect for outdoor ceremonies for up to 300 people. The gazebo area makes a perfect setting for your outdoor wedding and a 2,500 square foot banquet room for the reception. "An Empty Canvas To Paint The Event Of Your Dreams"
The lovely grounds of Pine Creek add to the experience and make wonderful wedding backdrops. We are here to make your day totally stress free from Set-Up to Clean Up...we do it All!! For your guests dining pleasure, choose from an array of foods from Hors d'oeuvres to Buffets or Plated Dinners. Let us make your wedding day as special as it can be!! We also have two lovely Honeymoon Cottages available for the perfect end to a perfect day. Let us pamper you in a secluded cottage, complete with heart shaped Jacuzzi tub, a fireplace, and a beautiful handmade king size pedestal bed. These cabins also have Satellite TV, stereo, DVD player, coffee service, microwave, personal refrigerators, and robes. The balconies overlook peaceful scenic views. While perfect for honeymoons, they also make a wonderful place to celebrate any special occasions, such as anniversaries and birthdays.